There are two types of people in this world. Those who like eggnog, and those who do not. I am one of those people who does not. In fact, not only do I not like it, I actually think it’s pretty gross. Something about drinking raw egg yolks, man, I just can’t get behind it. All I picture in my head when I think of eggnog is some meathead monster crushing weights at the gym after chugging a gallon of the stuff from his plastic GNC protein shaker while making uncomfortable grunting sounds as he admires himself in the mirror. And nobody likes the meathead monster at the gym chugging protein shakes from his plastic GNC protein shaker while making uncomfortable grunting sounds as he admires himself in the mirror. Don’t be the meathead monster at the gym chugging protein shakes from his plastic GNC protein shaker while making uncomfortable grunting sounds as he admires himself in the mirror. Now, don’t get me wrong, I’m still allll about the consumption of eggnog because it’s presence means one thing and one thing only — CHRISTMAS IS HERE — and anything that represents the coming of Christmas is okay in my book. I just hate the stuff. It’s gross. So let’s just agree to disagree and put that argument behind us. Glad we’re on the same page with things. However, there’s another holiday drink out there that just doesn’t seem to get as much universal love as eggnog, and that, my friends, is Coquito. 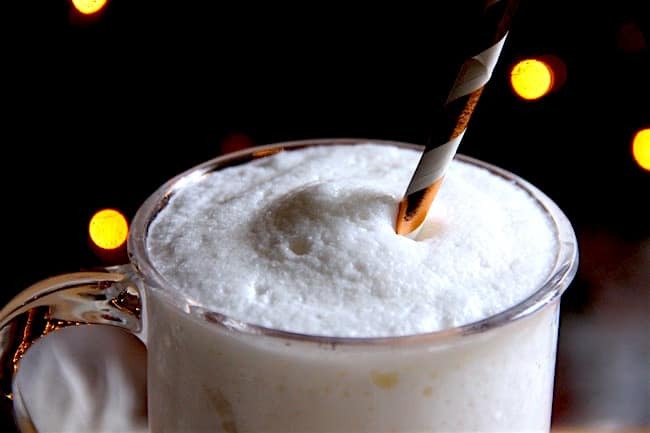 Coquito is a Puerto Rican drink that’s similar to eggnog, however prepared a little bit differently using ingredients like coconut milk, cinnamon, and light rum in lieu of dark. 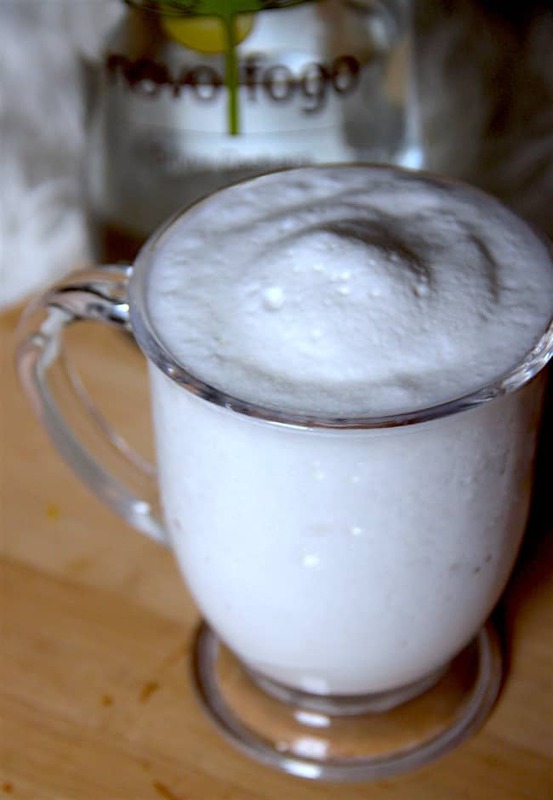 There are a few different variations to this drink, but the base ingredients will always be the same. It’s creamy, it’s delicious, and I’m utterly obsessed with the stuff. Not to mention that by now you have got to have caught on to the fact that I’m a freak for all things coconut, so really, are you really all that surprised that I’m infatuated with this creamy coconut nectar given to us by the Puerto Rican gods? Plus! I was gifted a bottle of Novo Fogo, and seeing as I had never tried this type of liquor before, I was intrigued to break it open and give it a whirl. 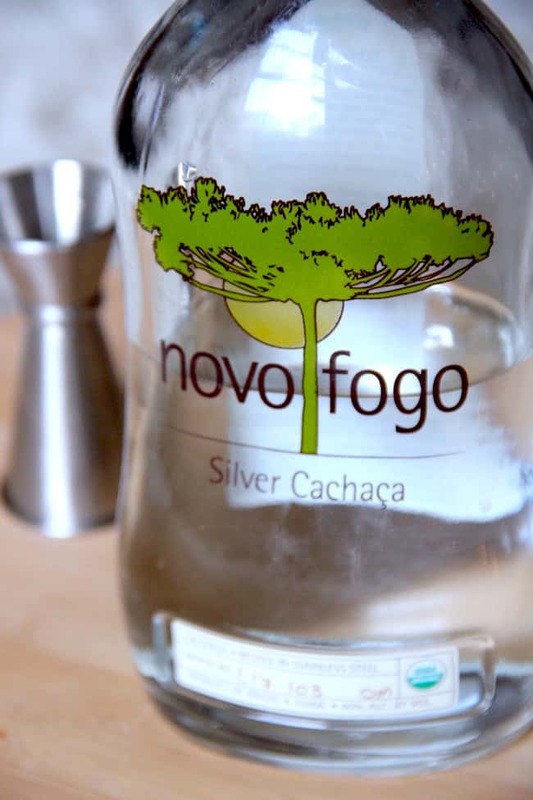 While Novo Fogo actually isn’t rum at all (which is what’s usually used in coquito), it’s been widely compared to rum by many and even called it’s Brazilian cousin. To be honest, replacing the rum with the Novo Fogo was an absolute winner, and I loved the different flavor compote that it added to the recipe. However, feel free to stick to regular rum if that’s what you prefer/have on hand! No joke, my boyfriend & I have consumed so much coquito this month, I’ve lost count of days, memories, events how many bottles we’ve already plowed through the stuff. While we’ve mainly been drinking it in our pajamas on the couch all month, it’s traditionally served on Christmas Eve and meant to be enjoyed with family and friends. Some people argue that you must use egg, while others see no place for them in the recipe at all. As you now know, I jive with that last group of people, so no egg will be used here today. What will be used? ICE. Because we makin’ FROZEN coquito, baby! (which just so happens to be my favorite way to drink it.) Not traditional, but hey, is anything about me traditional? Nope. Which leads me to my next point: I’m not really a fan of topping mine off with cinnamon, but that’s my prerogative, and most people (the traditional people) use it, so feel free to get sprinkling away! Make it tonight, make it tomorrow, make it for breakfast on Christmas morning. I don’t care, just be sure to make it. 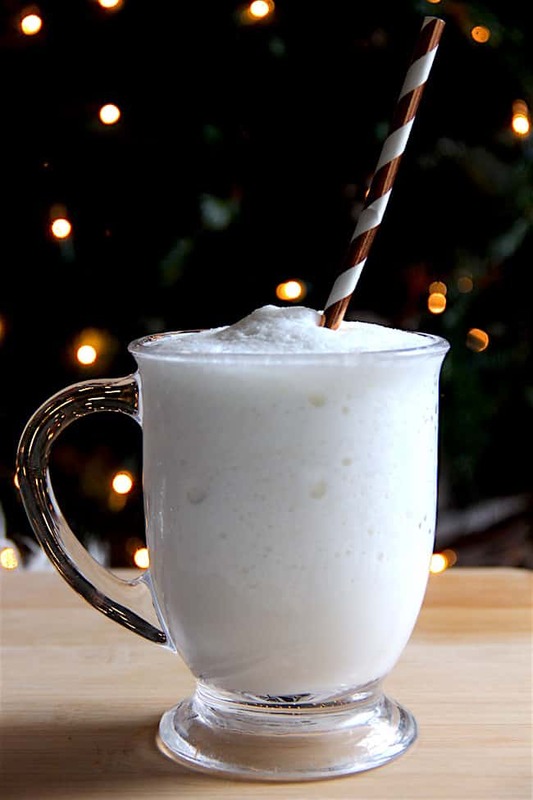 In a blender filled with ice, combine condensed milk, evaporated milk, coconut milk, and coconut cream. A good rule of thumb when using ice in a drink recipe is to add twice as much ice as everything else. I think it’s important to measure your ice before adding it to your blender that way you don’t end up with watered down coquito. Add in your cinnamon, nutmeg, vanilla extract + rum, and blend until everything is combined. Pour into cocktail glasses and serve immediately! If you’re making this ahead of time, add all of the ingredients to a blender WITHOUT ice, and blend everything until smooth. Transfer to a bottle that has a tight seal on it, and store it in the fridge until ready to use. If you plan to serve these frozen, just dump the mixture back into the blender that’s been filled with ice, and pulse until you get a smoothie-like consistency and ice is fully crushed/incorporated.